The Ottawa Senators’ hopes of defeating the Montreal Canadiens in the first round of the NHL playoffs rest largely on the play of Craig Anderson. The Senators goaltender was instrumental in getting Ottawa to the post-season. The Sens ranked 27th in the 30-team league in offence, but were second only to Chicago in allowing just 2.08 goals per game. However, Anderson has yet to win a playoff round in his career. 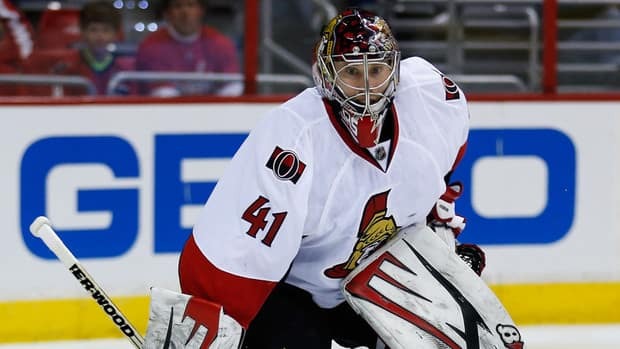 He was impressive in last year’s quarter-final series against the New York Rangers, which the Senators lost in Game 7, but he realizes that until he wins a playoff series many will question his ability to win when it counts. Anderson has a 5-8 career playoff record with two shutouts. Montreal’s Carey Price has played in twice as many playoff games as Anderson, but Ottawa’s 31-year-old goalie feels he learns from every series. Reputations may be earned in the playoffs, but Anderson’s performance this season can’t be overlooked. If not for a sprained ankle that kept him out of 19 games Anderson would likely in contention for the Vezina Trophy after posting a 12-9-2 regular season record with an impressive 1.69 goals-against-average and .941 save percentage, both league bests. Throughout their 20-year history the Senators have advanced to the playoffs 14 times, but rarely have they had a goaltender with Anderson’s combination of ability confidence and success. Alfredsson doesn’t believe the series will come down to a showdown between Anderson and Price, but does admit solid goaltending can give a team an advantage. Anderson’s play has instilled confidence and trust from his teammates all season long and they expect much will be the same once the playoffs start. With an averaging 2.33 goals per game, the Senators are the lowest scoring team in the playoffs. With goals likely to be at a premium during the post-season, Methot says the team feels good about its chances with Anderson in goal. Notes: Neither Chris Phillips nor Milan Michalek took part in practice Tuesday, but both are expected to practise Wednesday in Montreal. … Rather than practise at home Wednesday the Senators have chosen to head to Montreal as MacLean said the team is anxious to get immersed in the excitement of the playoffs. The Senators were travelling to Montreal by train.